The Writers Lab, produced by New York Women in Film & Television with The Writers Lab co-founders Elizabeth Kaiden and Nitza Wilon, was launched in 2015 to provide script development for women writers over the age of 40. It creates a springboard for scripts to reach the next stage of production and expands the diversity of narrative film. Supported by Meryl Streep and Nicole Kidman, The Lab is a four-day writers workshop that gives women screenwriters over the age of 40 the opportunity to work intensively on their feature film scripts with the support of established film professionals. Mentors and writers engage in a rigorous process of intensive script development through one-on-one meetings, panel discussions, peer workshops, and at group meals, Interactions are designed to inspire the artists; to prompt creative exploration; and, through revision, to cultivate first-rate cinematic stories. The Writers Lab is dedicated to developing narrative feature screenplays written by women over the age of 40. We feel it is critical to nurture the voices of mature women that have not been heard and are in danger of being lost entirely. We look forward to a new landscape where the female narrative is in equal proportion to the male narrative, and where shared stories strengthen our ties to one another and empower younger generations. We are committed to female storytellers, yet we do not limit our search to stories about women. The Writers Lab seeks well crafted scripts, in all genres, exploring universal themes, using a full range of cinematic tools. 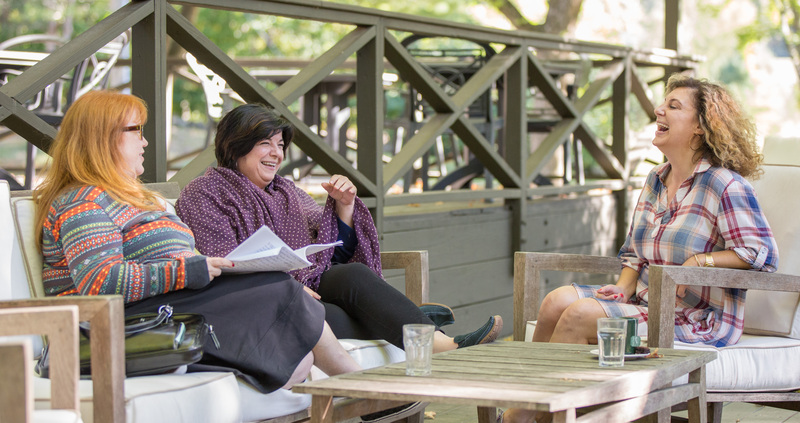 The Writers Lab 2019 is produced by New York Women in Film & Television, with co-founders Elizabeth Kaiden and Nitza Wilon, and has been supported by Meryl Streep, Nicole Kidman and Oprah Winfrey. It is presented in collaboration with the Writers Guild America, East, with in-kind support from The Black List, Film Fatales, Tribeca Film Institute, Roadmap Writers, Relativity Ventures, and Stony Brook Southampton + Manhattan. A special thank you to Final Draft for their product contribution. Past mentors include Jessica Bendinger (Bring It On, Aquamarine), Susan Cartsonis (Carrie Pilby, The Duff), Rachel Cohen (Stranger Weather, House of Z), Lisa Cortes (Precious), Amy Fox (Equity), Pamela Gray(A Walk on the Moon, Music of the Heart), Caroline Kaplan (Time Out of Mind, Personal Velocity), Meg LeFauve (Inside Out, The Dangerous Lives of Altar Boys), Darnell Martin (Cadillac Records, I Like It Like That), Gina Prince-Bythewood (Secret Life of Bees, Beyond the Lights), Mary Jane Skalski (Win Win, The Station Agent), Kirsten Smith (Legally Blonde, Ten Things I Hate About You), Guinevere Turner (American Psycho, The Notorious Bettie Page), Pat Verducci (Disney/Pixar), Ligiah Villalobos (Under the Same Moon, Firelight).